Yes, the winter has finally subsided with it’s cold, ice, and snow piles. But while the cold weather has gone away, the damage the winter inflicted on your cat hasn’t. With the large potholes and other damage your car has endured, it may be time to replace your shocks and struts. 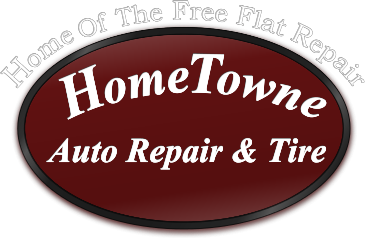 Keeping your vehicle maintained will keep repair costs down over the long run. These are 5 signs that it’s time to get your shocks and struts inspected, repaired, or replaced. 1. Your car is going in for a nose dive. When you’re turning, speeding up, or braking, are you having more difficulty controlling your vehicle? When you’re stopping, do you notice that the ‘nose’ of your car is diving forward, even when you’re only lightly braking? 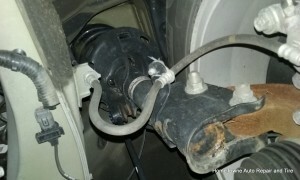 That is a common sign that the shocks and struts on your vehicle are worn and need to be replaced. 2. Overall, the handling is off. If you drive your car frequently, you know it well – how it drives, how it performs under different conditions. And if all of a sudden you’re noticing that the handling of your vehicle – maybe a bumpier or rougher ride – then chances are that your shocks and struts are in need of repair or replacement. Suspension Strut Assembly on a car, these can start to show signs of wear around 50,000 milesYou’re hearing squeaking sounds coming from your vehicle. 3. You’re hearing squeaking sounds coming from your vehicle. When your car squeaks, that’s a pretty good indication that there’s some kind of issue. Whether you’re just driving down the road, braking, or you’re running over a pothole or rough patch, if you’re hearing squeaking from your suspension then it’s time to bring your car in to have your shocks and struts inspected for wear. 4. There’s uneven wear on your tires. This sign is the easiest to visually see. 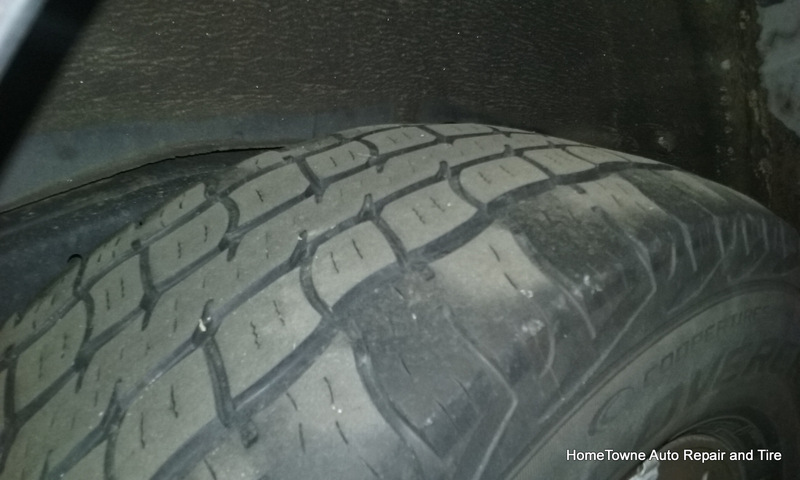 When your shocks and struts are worn down, there’s more bouncing and that bouncing means that your tire is also moving around as it hits the ground, losing rubber in the process. This is called cupping. If you see uneven wear or smooth patches on your tires, then it’s important for you to come in and have the shocks and struts looked at. 5. 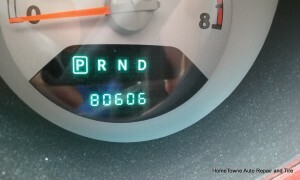 Your vehicle has more than 50,000 miles. A tire wear pattern like this can be due to worn shocks and struts. While every car is different, and road conditions impact the life of car parts, if your car is over 50,000 miles and you’re having some issues, then it could be because of your shocks and struts. We follow the guidance from the Motorist Assurance Program that recommends that drivers replace their shocks and struts after 50,000 miles. If it is time to replace your shocks and struts, the time to do it is now. 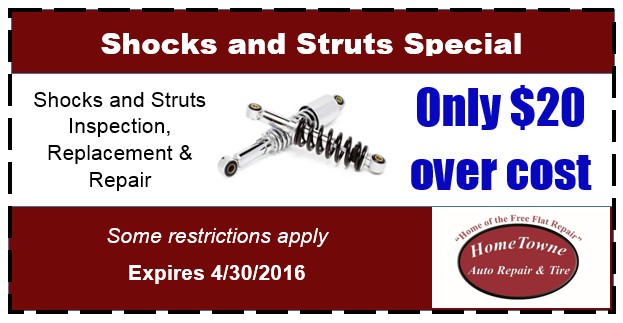 Our shop is offering an inspection, repair, and replacement on shocks and struts now for only $20 over cost until April 30, 2016.